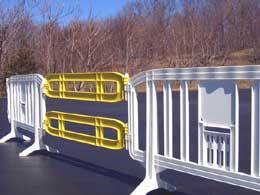 Looking for a more flexible solution to the heavy steel crowd control barricades? 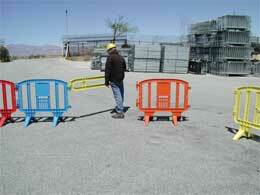 Boulevard Supply is a dealer of Minit™ lightweight plastic barricades. These 4′ wide plastic crowd control barriers are an ideal choice for schools, parking services companies, construction companies, concert and sports venues, municipalities and event companies. MINIT™ plastic crowd control barriers are made of recyclable polypropylene. The feet are fixed and not removeable which adds extra support and increases durability. The 15 lb barricades are easy to handle and ideal for outdoor and indoor use. They interlock to form a sturdy crowd control barrier and use little storage space. These 4′ barricades can also be used with the wider Movit® plastic barricades which are 6.6′ in length. Minit™ and Movit® plastic crowd control barriers will not rust. You can reduce the cost of you plastic barricade purchase by utilizing Extendit! These are 5′ long plastic extensions designed to work with MINIT™ and MOVIT® plastic barricades. 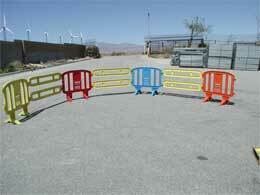 Extendit plastic barricade extensions come in the same colors as the MINIT™ and MOVIT® plastic barriers. You can display your logo or any advertising on either side of the barrier in the 11.6″ x 11.6″ centered display area. QUANTITY: How many plastic crowd control barricades will you need? BARRICADE COLOR CHOICE: You can mix and match if you wish but we will have to check availability on all choices. DESTINATION: For an accurate quote, please provide us with the destination zip code when inquiring about Minit™ plastic crowd control barriers. Are we delivering to a business or residence? Do you have a fork lift or loading dock available if ordering in bulk? Will you need lift gate service? Any special instructions?